Director Tom McCarthy needed some redemption this year. He made an oddball comedy, released early in 2015, starring Adam Sandler, called The Cobbler. Everybody trashed it. I didn't even see it. 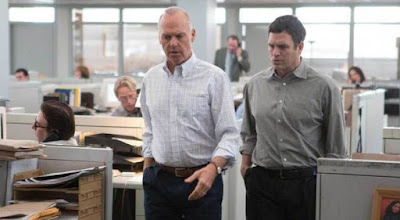 Now, here is his second film this year, your Best Picture frontrunner, Spotlight, a film of calm assuredness, free of frills and excesses, drawing a picture of an institution gone just plain wrong in the darkest of ways, made darker by a cover-up of maddening proportions. The institution alluded to is the Roman Catholic Church. And, while it's easy to make tasteless jokes and fueled-up political rants about its lurid child abuse scandal brought to light over the course of 2001 and 2002 by the crack "Spotlight" team of investigative journalists at The Boston Globe, this movie is everything but a smear campaign. It is a story of people torn between doing the right thing and turning against the Church that was supposed to teach them the right thing. 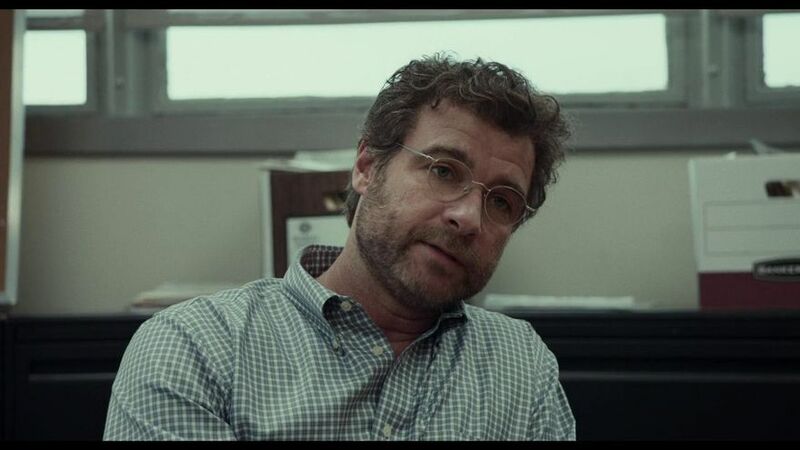 In 2001, Boston's number one daily hired an outsider as editor in Marty Baron (Liev Schreiber), a quiet Jewish loner known previously for his work at The New York Times and The Miami Herald. Since he has no ties to the Catholic Church, besides that he lives in Boston now, where nearly everyone is Catholic, he is the perfect guy to shake things up. A Boston priest of forty plus years named John Geoghan, among others, has a line of people claiming sexual abuse. Nobody, not even the Globe, is covering the story. Why? 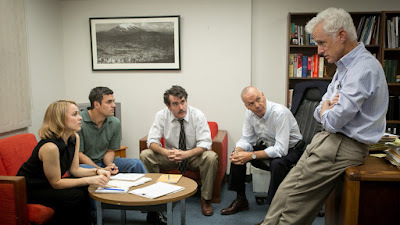 That question is posed first to Walter "Robby" Robinson (Michael Keaton) and his superior Ben Bradlee (John Slattery). Robby heads up the slow-moving, deep-digging investigative team the title suggests, a group of fearless journalists, including Michael Rezendes (Mark Ruffalo) and Sacha Pfeiffer (Rachel McAdams). It is decided in Baron's first editorial meeting. This is the story Spotlight will chase. Drawing comparisons to the great procedural journalism pictures like All the President's Men, McCarthy's film is downright perfect in every way. It shows us three fully-developed worlds; one of power-driven corruption, one of devastating mental illness and addiction brought on by pedophilia, and one of investigative reporting. It doesn't demonize the Church or priests. In fact, we hardly see any of the accused priests. It only so subtly breaks through "the system" that led the cover-up, headed up by Boston Archdiocese Cardinal Bernard Law (Len Cariou). It is maddening but not hateful. Important but not proud. Riding those lines is a masterstroke of filmmaking. Lawyers are involved as well. One out to tear down "the system," the one to speak for the victims of these abuses in Mitchell Garabedian (Stanly Tucci). The other is one beaten down by the Church itself, forced into shady dealings and cover-ups in Eric Macleish (Billy Crudup). Then, there is one afraid to even talk of it, though he knows so much in Jim Sullivan (Jamey Sheridan), the attorney representing the Church. Through forced meetings with these three lawyers, whose cases have been locked up tighter than the gold at Fort Knox, Robby's team chips away over the course of a year to find out as much as they can. And they do. And we watch, hanging on every new development. Developments as shocking as the fact that somewhere near 6% of all Catholic priests have been involved in some sort of sexual abuse, then shuffled around from parish to parish, covered-up, saved by a "system" unwilling to admit fault. We don't simply watch their research, their countless interviews, their soul-searching. We go through it with them. The triumph of this film, apart from the lines drawn by McCarthy's direction and the tight script by McCarthy and screenwriter Josh Singer, lies in the performances from Michael Keaton, Rachel McAdams, Liev Schreiber, and Mark Ruffalo. Especially Ruffalo. As Michael Rezendes, Ruffalo provides some of the films most personal moments. Moments that remind us of how this scandal (one I only vaguely remember) affected everyone of the Catholic faith. He and this crew of journalists are all lapsed Catholics, remembering a Church they loved and thought they might even go back to one day. Their faith, even in the lack of it, was tested. And, through these performances, so is ours. Keaton, as the leader, the one with the connections, provides another performance, after last year's Birdman, that works again to prove just how solid he is. We are glad to have him back. His Robby is a tough man, willing to take blame, admit fault, and never falter on getting his story. As I alluded to before, Spotlight is not a flashy, showy exposé meant to make us angry and even more cynical and skeptical than we already are. It is a film meant to enlighten us on the ways of journalistic integrity and excellence, through which it becomes a means also to enlighten a darkness that shrouded a Church of astounding history and importance to thousands of our world's cultures. A Church with a billion members, all of whom felt the sting that the work of a half dozen Boston newspaper men and women poured over, cried over, lost chunks of their lives over, in order to issue truth to the public. We can only thank them for it and appreciate the work only the greatest journalists can do. For inspiring that alone, it is easy to call Spotlight one of the best films of the year. This is definitely THE BEST FILM of the year. 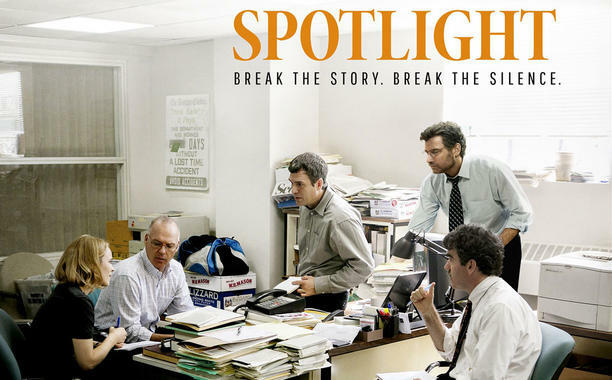 I cannot say enough great things about Spotlight. Everything was just pure excellence. I highly, highly doubt I will see a better film this year. I loved Spotlight so much I am going to see it again this weekend. I cannot give enough praise to this film. I think 2015 is one of the best years in film in a while, probably since 2010. There have been so many great films this year (in my opinion) that some of them may not make it in my top 10 films of the year. And also, I am going to see The Hateful Eight on Christmas in the special 70mm release. I cannot freakin' wait! And also, I have finished watching The Newsroom. It is probably one of the 3 best TV shows I have ever watched. This show definitely proves that Aaron Sorkin is a genius. I don't have anything to add since I haven't seen this, yet. I just wanted to say I love the enthusiasm dripping from Cameron's comment. Thanks! Spotlight was just one of those films you couldn't help but be enthusiastic about it. It was just so excellent. Wendell, it is hard not to be taken in by Cameron's passion for movies. Thanks for reading and commenting so much here, Cameron. Can't wait to continue reading your positive takes on so many of the great movies you see. Great review. I love this movie, it's easily one of my favorites and one of the (I think 2) A+'s I've handed out this year. Newspaper dynasty, those Bradlees. Lol. Need to re-watch All the President's Men myself. Been too long. Thanks. I really loved it too. It's in the middle of the pack as far as my favorites of the year right now. My A+ movies would be Ex Machina, The End of the Tour, and Inside Out, as of right now. So many rave reviews I've been reading! I can imagine Spotlight winning best picture or at least as a contender to win. Subject matter is disturbing, so I'm not sure this is my cup of tea. Although judging from your review, it's about the journalistic side. It's something to rave about, man, I'm telling you. It's a contender. For your own piece of mind, the film does go into some detail about some of the abuses, but not in an over-the-top, shocking way. It is matter of fact and tastefully handled. Well worth seeing. I have avoided this, but based on your review, I now want to see it. I enjoyed the movie, and although I think it will get a lot of best picture buzz, it is not necessarily in my top movies of the year. The acting, however, should because everyone was fantastic. Great performances for sure. Really solid.